As I've written before, Fernley is built on an ancient lake bed that is part of the interconnected playas that include the Black Rock Desert. (According to the Wikipedia article, the lake mostly dried up about 9,000 years ago, leaving Pyramid Lake, Walker Lake, and some other outliers.) A consequence of this is that water pools up here without draining or soaking into the soil very much. Thus, the heavy rain over the weekend fills up all the low spots, and the water tends to stay there until it evaporates. Just down the street from Fernley House is the plant (now owned by Imerys) that produces Celite and DiaFil brand diatomaceous earth products. We call their building (one of the tallest in the city; it's not visible in the picture below, being a tower to the right of where I was standing when I took the shot) the "kitty litter factory," although that badly over-simplifies it. 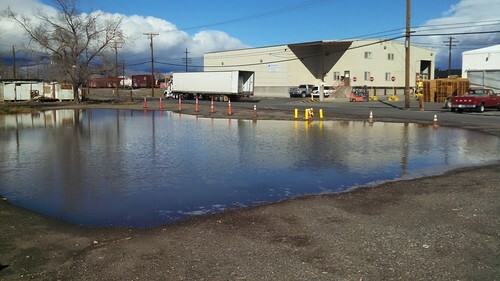 While out for a walk yesterday morning, I took a picture of the lot next to the Celite plant, which is lower than the area around it, to show the effect of the rain. When the weather is dry, they park trucks here, but it's coned off now. I'm contemplating printing a sign that says "Lake Imerys/Private Property/No Fishing or Swimming" and stick it to one of the pylons at night to see if anyone notices.